Many visitors passing through Duluth on their way up the North Shore, and many Duluthians as well, have passed the “gingerbread house”—just west of the Lester River Bridge on the south side of London Road—without giving the structure a second thought, as it sat neglected, looking downright abandoned as its paint peeled away with the years. But since its recent renovation, the building stands out as one of the most grand in the Zenith City, begging the question, why was that ornate structure built at the mouth of the Lester River? The answer is simple: the majority of its tenants were tiny fish. The building was constructed as the Lester Park Fish Hatchery, the brainchild of Dr. Robert Ormsby Sweeney, a true Minnesota pioneer and somewhat of a renaissance man. Born a Philadelphia Quaker, Sweeney came to Minnesota territory in 1852 as a trained pharmacist who considered himself an artist by occupation. A pioneer settler of St. Paul, Dr. Sweeney opened the first pharmacy in the state’s capital—leaving only to serve in the Union Army as an unpaid pharmacist during the Civil War—and, according to his obituary, designed the state seal. When Minnesota became a state in 1858, Governor Henry Sibley wanted to make changes to the territorial seal before it became the symbol of the new state for several reasons. First, the Latin motto Quo sursum vela verde (“I want to see what lies beyond,” a nod to early French voyageurs) contained a couple of typos. Second, the image—intended to depict a pioneer settler plowing a field while a Native American rides west into the sunset to peacefully resettle outside of Minnesota territory—was originally printed backward, and so the Native American was heading toward already-settled Wisconsin). At the same time, Minnesota Senator Knute Nelson was backing a movement to start a government fish hatchery along Lake Superior to help the growing commercial fishing industry on the big lake and make Duluth one of the world’s leaders in fish production. 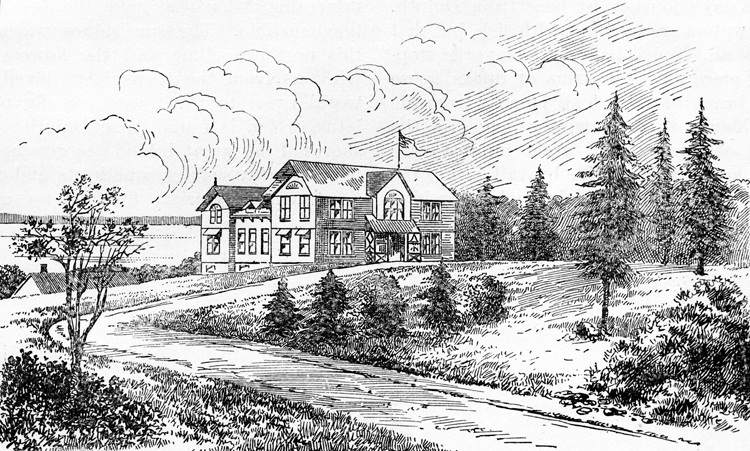 On April 16, 1886, the Duluth Weekly Tribune announced that the government was considering placing that hatchery at the mouth of the Lester River, at that time part of the Village of Lakeside. Dr. Sweeney, then president of the Minnesota Fisheries Association, was tapped to take the lead on the project. By January the following year, the newspaper wrote of the facility as an inevitability and announced that it would be the “largest and the best” such facility “in the world.” Sweeney himself provided a sketch of the proposed complex. The Lakeside Land Company, which developed much of the Lakeside and Lester Park neighborhoods, recognized the value of the hatchery and donated the land for the project. It took some time for plans and the contract bidding process, but finally, on June 25, 1888, construction began. As work neared completion in September, the government announced that Dr. Sweeney himself would become the hatchery’s first superintendent. Sweeney wanted the facility hatching fish by mid-November to coincide with the opening of the whitefish season—the facility promised to produce 50 million whitefish fingerlings each year. Besides whitefish (the most popular fish produced in Lake Superior at the time) the hatchery would also raise lake trout, and the facility’s capacity would eventually increase to 150 million eggs per year. The facility was later served by a dam that was built on the Lester River; a flume carried fresh Lester River water from the dam to the fish hatchery. Inside the facility’s main building—and in warmer months, outside of the building as well—108 long, narrow troughs were built as “nurseries” in which the eggs would hatch and develop until the fingerlings were large enough to be stocked into Lake Superior and elsewhere. The troughs (or “pockets”) each held eight or nine trays of eggs, and each tray contained 6,000 to 9,000 eggs. Much of that whitefish caviar was provided by local fisherman, who brought in fertilized roe found in caught and cleaned female fish. The majority of the fish produced at the hatchery were released at the mouths of streams along the Minnesota North Shore and sometimes the Wisconsin South Shore. Some fingerlings helped stock Pike Lake and Lake Vermilion, but only rarely were any of the fish distributed outside of Lake Superior. When first built, the hatchery complex contained not only the main laboratory (hatchery), but also a pump house, a boat house, a carriage barn, and homes for both the facility’s superintendent and supervisor and their families. The main two-story building was executed in the Stick-and-Shingle Style popular in the late Victorian era. 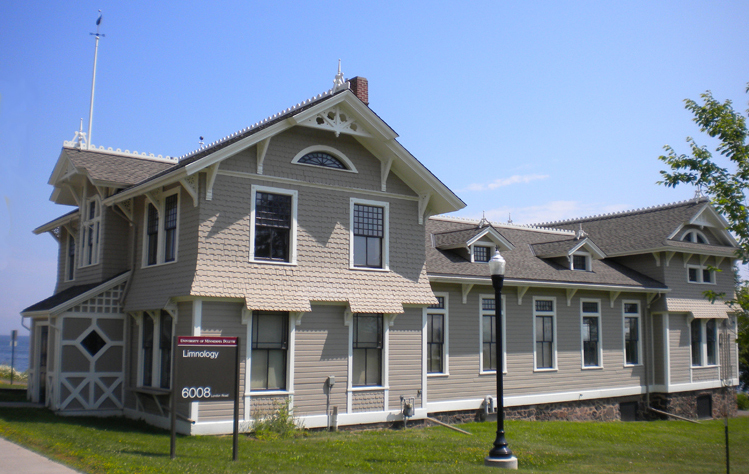 The “I”-shaped building, which sits on a foundation of black Lake Superior stone, is adorned with typical Victorian flourishes, such as scalloped shingles, stick-work brackets on the eaves and gables, sometimes with additional sunburst and pierced ornaments as well. On top of the building sat a weathervane of a very appropriate design: A large metal whitefish pointed out the wind’s direction. By 1894 S. P. Wires had replaced Dr. Sweeney as superintendent, but Sweeney remained heavily involved and he and his wife remained in the superintendent’s house. By then the hatchery was also raising brook tout, rainbow trout, pike-perch, and walleye pike. Dr. Sweeney died at his home next to the hatchery on September 6, 1902. Besides his expertise with pharmaceuticals and all things piscatorial, Dr. Sweeney was considered a “remarkable” artist, and his obituary noted that “Empire Builder” James J. Hill—considered to have acquired the “finest art collection in the West”—not only owned but “highly treasured” one of Sweeney’s works. During his lifetime Sweeney also gathered Native American artifacts and his collection was thought to be the largest outside that of the Smithsonian Institute. That fact did little to propel the hatchery much further into the future. In 1946, citing inefficient operation, the federal government closed the facility. By that time the Lester River’s waters had become too warm for most fish, including the popular lake trout, to be raised in; the French River facility was much more suited to the task. Lake Superior could have used the facility: by then smelt, sea lamprey, and other invasive species were ruining the Lake Superior fishing industry. So despite complaints by local fishermen and officials, in 1947 the facility was sold to the University of Minnesota Duluth. UMD used the facility as a freshwater research facility, officially the University’s Limnological Research Station. Between 1955 and 1956 the building was renovated to better serve its new purpose. According to Cathy Wurzer’s Tales of the Road: Highway 61, the facility was used in the 1960s and ’70s for research on acid rain and mercury contamination in conjunction with the Environmental Protection Agency. When the funding for those projects ended, so did research at the facility; except for summer programs for graduate students, it sat unused. In 1978 the relatively dormant building was placed on the National Register of Historic Places. The structure received an award for restoration work that uncovered boarded-up windows, rebuilt others, installed a new shingle roof, replaced wood gutters with reclaimed cedar, and added a period color scheme to the exterior of the structure. In addition to the maintenance work, the University crew replaced missing trim and installed spires at the gable ends to match the 1880s building. They also rebuilt the front and rear entrances. Then the UMD crew went above and beyond in restoring the decorative cresting on the roof ridge. The cresting was fabricated in the UMD facilities management shop with recycled old growth redwood. Finally, the crew replaced the weather vane mast. The mast was adorned with a fish, a replica of the original. 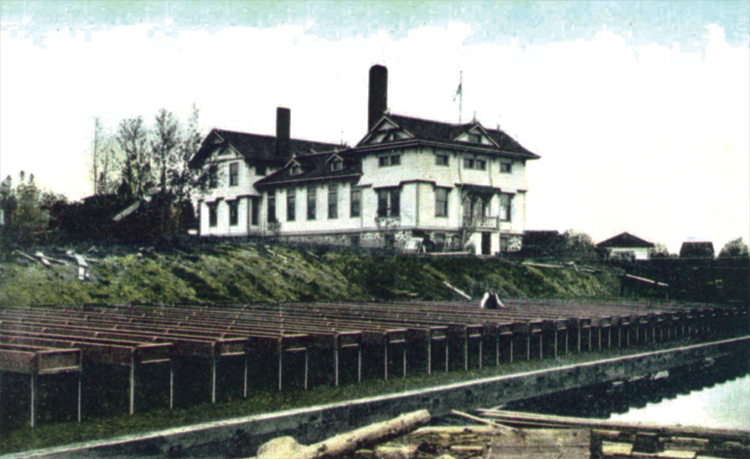 Today, the pump house, boat house, central building, and superintendent’s house still stand, but the supervisor’s house was demolished some time after UMD took possession. The UMD Rec Sports Department uses the hatchery’s boathouse in the summer as the Lester Park Surf & Kayak Shack, an equipment rental facility. While the building remains unused, plans are in the works for its future. Local businessman Douglas Artez is considering leasing the facility from UMD and use it as the home of the Duluth Fish & Seafood Co., a commercial fish and seafood market that would specialize in fresh Lake Superior fish. It certainly would be a wonderful adaption for reuse: a market for fresh or smoked fish at the same facility that once helped Lake Superior’s, and especially Duluth’s, commercial fishing industry.